Suffice it to say, it’s hardly a shock that Mitt Romney is on the verge of losing Ohio. It doesn’t take a political scientist to see how a guy might struggle after urging bankruptcy for a state’s key industry, as Romney did for the automakers. And Romney’s lord-of-finance pedigree was never going to endear him to Ohio’s proletarian class. For that matter, even George W. Bush, who was burdened by neither a betrayal of the car industry nor Wall Street success, barely carried the state, winning by 2.5 percentage points in 2004 and 3.5 points four years earlier. Nonetheless, the simple fact that Romney has kept Ohio close—that he may only lose narrowly in a place Republicans frequently win—suggests there was something he could have done to change the likely outcome. Sure, the auto bailout was a lost cause. But, at the very least, there were ways to neutralize the “rapacious capitalist” line on his CV. I’m thinking in particular about four policy issues that would have helped him play against type: Tax goodies for the rich, Chinese currency manipulation, overgrown banks, and Wall Street speculators. Romney might have led in the polls heading into Election Day had he staked out more populist terrain in any of these areas. Consider taxes. Romney personally saves millions of dollars each year because most of his earnings come from investment income, which is taxed at the 15 percent capital-gains rate instead of the 36 percent rate he’d pay on a salary. Coming out for raising that rate would have bought him instant credibility with voters, many of whom pay a higher effective rate than he does. But instead he assured us he’ll preserve his own windfall. On China, Romney has famously said he would declare the country a currency manipulator on his first day in office. But as anyone familiar with U.S.-China economic relations will tell you, the currency manipulator designation is largely symbolic. It triggers no substantive retaliation of any kind. Though China wouldn’t exactly have welcomed the designation—its leaders certainly discouraged the Obama administration from making it—they would no doubt have understood the context in which Romney made the promise and would have taken it in stride. And that’s assuming he even followed through, which is unlikely given the amount of wiggle room involved. A truly tough China policy, by contrast, would be a measure like the one the Senate passed last October, which mandated stiff tariffs for Chinese goods if the country tamped down its currency. But, of course, Romney never came anywhere close to endorsing such a bill. As for Wall Street, Romney did try getting to Obama’s left on financial reform during the first presidential debate, complaining that the Dodd-Frank bill Obama signed in 2010 commits the government to bailing out big banks. But anyone can criticize the president for perpetuating “too big to fail,” as Romney’s fellow Republicans did over and over again during the legislative fight that spring. The criticism is transparently disingenuous as long as you duck any measure that actually gets tough on big banks, as Romney has today and congressional Republicans did back then. If the GOP nominee wanted to put his money where his mouth is, he could have supported the Brown-Kaufman “Safe Banking Act,” which would have forced the three largest megabanks to split themselves roughly in half. Shockingly, he did not. Finally, Romney could have showed that he prizes productive investment over rank speculation by, say, favoring a financial transactions tax that makes it costly to move in and out of stocks with lightning speed. He could have proposed limiting the deductibility of interest on corporate debt, which would have made it much less profitable for his fellow private-equity magnates to take over companies and bury them debt. Once again, he took a pass. It’s not that Romney was oblivious to his Bain Capital baggage, as his musings on China and financial reform make clear. It’s that halfsies were never going to cut it in a place like Ohio. The state has a high rate of union membership (about 14 percent, versus 5 percent in Virginia and 6 percent in Florida), and those union members vote in large numbers (about 28 percent of the Ohio electorate in 2008). More importantly, unlike their counterparts in Florida and Virginia, Ohio’s working-class voters are acutely aware of their economic self-interest. As one labor official recently explained it to me, they aren’t reliant on the flighty media to scrutinize a candidate’s positions. They have their own sources of information through their unions. And, whatever else you might say about unions, they can certainly smell a rat when they find one. All of which is to say, if Romney was going to move working-class votes in Ohio, he was going to have to embrace a concrete version of at least one of these policies. Still, it could easily have worked for him had he gone that route. As the labor official told me, “I don’t know what we would have done if he’d supported the [Senate China] bill.” It would have been an instance of Romney genuinely outflanking Obama, whose administration has resisted the bill and has gone so far as to make common cause with John Boehner’s House Republicans to bottle it up. And yet, in retrospect, there was never any risk of Romney endorsing something so specific it would force him to get tough as president. To see this, you could start by consulting his top six sources of campaign cash—a few mom and pop operations that go by the name of Goldman Sachs, Bank of America, Morgan Stanley, JP Morgan Chase, Credit Suisse, and Wells Fargo. It’s hard to believe these masters of the universe would have pitched in more than $5 million if they weren’t clear on what they were getting in return. More importantly, Romney would never have committed himself to truly populist policies because—how to put it?—they make him want to dry heave. The conventional wisdom is that Romney is completely conviction-less—that he will very nearly say and do anything to get himself elected. And, over the past six years, he’s certainly done a fine job persuading us of that. But, as it happens, the conventional wisdom is wrong here. 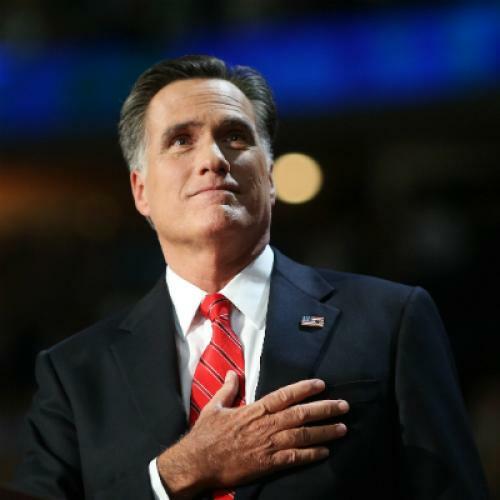 Romney turns out to be a true-believer in at least once cause: the cause of finance-capitalism. He is, in fact, so devoted to the creed that he refused to embrace the one set of policies that could have handed him the presidency. To a rather breathtaking extent, then, Mitt Romney isn’t on the verge of losing because he lacks principle. He’s on the verge of losing for his principles. You almost have to stand back and admire the guy.